Also referred as Maqbara-e-Humayun, Humayun's tomb is an architectural masterpiece. It is considered to be the first garden tomb to be built in Indian. It is the tomb of Mughal emperor Humayun. Humayun's tomb has been declared a UNESCO world heritage site in 1993 which further adds on to importance of this impressive structure of red sandstone. Humayun’s tomb is the first structure in India that was built in the Mughal style of architecture. This tomb was built by the first and the chief consort of Mughal emperor, Bega Begum, who was also known as Haji Begum. She had then chosen a Persian architect, Mirak Mirza Ghiyas to design the tomb. Unfortunately, the architect Mirak Mirza Ghiyas died before the completion of the complex. Hence, son Sayyid Muhammad ibn Mirak Ghiyath Ud Din completed the work on his father’s architecture. The work on Humayun’s tomb had started in 1565 and was completed in 1572. The work on the tomb started 9 years after the death of Emperor Humayun. Located in the middle of a garden complex, Humayun’s tomb is built on a raised platform of 7 m height. The garden around the tomb is Char Bagh garden, which is typical Persian layout, symbolizing the garden of paradise. The Humayun’s tomb is 47 m high and 91 m wide, while the domes have the height of 42.5 m. Its red sandstone structure, with white marble double domes creates an impressive sight. Lattice work, pietra dura floors and attics add on to the overall beauty of the tomb. There are many prominent buildings inside the Humayun’s tomb complex consisting of tombs, mosques along with an accommodation. Arab Sarai, Nila Guband and Bu Halima are a few of the buildings worth noticing. There are around 150 tombs in the entire Humayun’s tomb complex, while the tombs of Bega Begum, Hamida Banu Begum, Dara Shikoh and Isa Khan are situated within the main complex of the tomb. Along with these, there are also tombs of other Mughal royals such as Emperor Jahandar Shah, Muhammad Kam Bakhsh Farrukhsiyar, Rafi Ud-Daulat, Rafi Ul-Darjat, and Alamgir II. Outside the Humayun’s complex, shrine of Hazrat Nizamuddin Auliya, a sufi saint from 14th century is located. It was considered auspicious to be buried near the shrine, hence many Mughal royals were buried at the Humayun’s tomb complex. Humayun’s Tomb timings are from 6 AM to 6 PM. Humayun’s tomb entry fee is Rs.30 for Indian cities and tourists from SAARC nations (Bangladesh, Nepal, Bhutan, Sri Lanka, Pakistan, Maldives and Afghanistan) and BIMSTEC (Bangladesh, Nepal, Bhutan, Sri Lanka, Thailand and Myanmar). While for tourists from other than these nations, the ticket price is Rs. 500 per person. How to reach Humayun's Tomb? Reaching Humayun’s tomb is extremely hassle-free as tourists will find metro station and bus stands nearby. It is located just opposite to the Dargah Nizamuddin. The nearest metro stations to Humayun’s Tomb are Jorbagh and Race Course stations. There are also regular ac and non ac city buses that run from Rajiv Chowk, ISBT or Nizamuddin to Humayun’s tomb complex. Tourists can also hire taxis or take locally run auto-rickshaws. 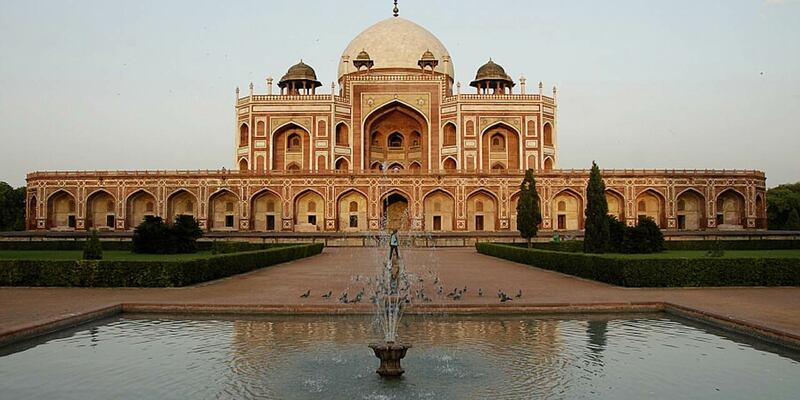 Where is Humayun's tomb located in Delhi? Humayun's tomb is located in Mathura Road, opposite to Nizamuddin Dargah. Why was Humayun's tomb built? Humayun's tomb was built to house the remains of the Mughal emperor Humayun. Humayun's tomb was built by Bega Begum, the first wife and chief consort of Humayun. When was Humayun's tomb built? The construction of Humayun's tomb was started in 1565 A.D by the Persian archtect Mirak Mirza Ghiyath. Due to the untimely death of Mirak Mirza Ghiyath, his son Sayyid Muhammad ibn Mirak Ghiyath Ud Din completed the construction of the tomb. Humayun's tombs' construction was completed in the year 1572 A.D. When is the opening time and closing time of Humayun's tomb? Humayun's tomb opening time is 6 AM and the closing time is 6 PM. It is open on all days of the week.